Hair loss and thinning can come from a variety of places, like genetics or childbirth, but it can also be a reaction to breakage from physical damage — AKA the way you treat your hair when you’re styling or even drying it after the shower. Uh oh! Super-tight styles are one of the leading contenders when it comes to breakage, but don’t worry. You don’t have to completely give up your ponytails or braids to save your hair. Aveda Global Educator Bea Carmichael shares five easy ways to minimize breakage in your daily hair routine; you and your hair will be so much happier! Be extra gentle when your hair is wet. Start the care right away. Don’t pull your hair up into a towel turban or roughly dry it post-shower. Try a microfiber towel or t-shirt and gently squeeze out excess moisture instead. Your hair is vulnerable when it’s wet, so try not to put any extra stress on it. Reduce heat styling. “Heat puts stress on the hair and can cause breakage if it’s a bit brittle,” Bea says. “When you’re stretching the hair [like with a blowdryer] and changing the texture, it can put stress on the hair and follicle.” If you must heat style, Bea recommends using a minimal routine of a dryer or diffuser on low heat and low speed. Embrace your natural texture. Think about what your hair wants to do naturally, and try products that are meant to enhance what you already have. 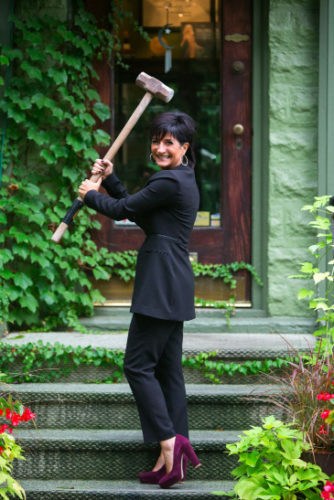 “Work with your stylist to get the right products to maximize what you have,” Bea says. 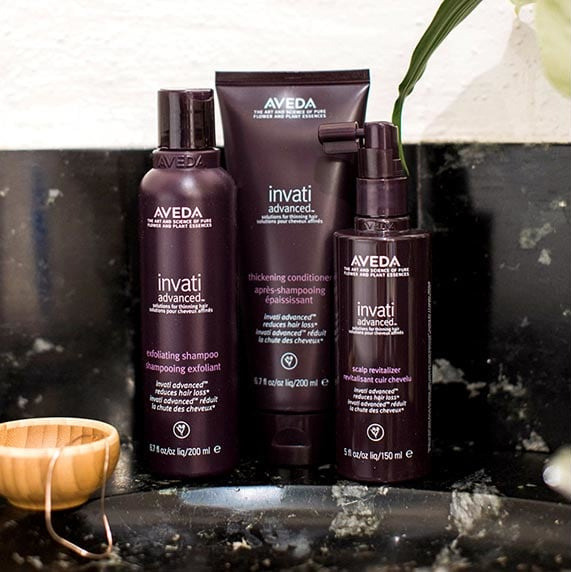 “Products can really help, from the right shampoo to styling products.” She loves that the Aveda prep products all help detangle hair, and recommends Damage Remedy Daily Hair Repair, Brilliant Damage Control, Be Curly Style-Prep or Smooth Infusion Style-Prep Smoother. Take a break from the super-tight ponytails. “The less strain you put on the hair the better,” Bea advises. “Avoid tight ponytails, curlers or braids that put stress on the hair.” Try looser updos and hold them with pins, not hair bands. If you must pony up, try a soft scrunchie or ribbon elastic instead of a tight, traditional pony elastic. Your hair will thank you. A few weeks ago, I was totally stoked when I was contacted by Sara Visser, who writes one of my favorite blogs, The GR Guide. Sara wanted to do a makeover session! This past weekend, we were able to carve some time into our schedules to get together at the salon. I couldn’t wait to see what Sara was thinking and In the consultation, Sara brought in a picture of Sienna Miller with an awesome beachy blonde look. Sara has a pretty dark blonde natural color, and super long hair, so I knew we had some work to do! I started out by cutting off about 3.5 inches of Sara’s hair. I then added some long, soft layers to accent the wavy style she planned on wearing. After finishing the dry haircut, I added a bunch of baby lights (basically teeny-tiny, itsy-bitsy amounts of hair in regular foils) throughout her entire head. I strategically placed a bunch of the baby lights very close to Sara’s hairline for a POP of brightness. I brought the highlights a bit further apart as I moved through the crown and back of the head. This mimics what the sun actually does to your hair when you spend a lot of time basking in it. Because we’re adults, and we don’t actually have time to bask in the sun for hours and hours like we did as kids (not to mention the hazards of skin cancer), it’s awesome that we can achieve this look with a few hours and some Aveda Color! To style Sara’s hair, I used Aveda Smooth Infusion Styling Creme on the ends and Pure Abundance Style Prep on the roots when it was wet. Then I blew it dry with just a blow dryer and my fingers. When the hair was almost dry, I used a round brush to smooth out frizz. 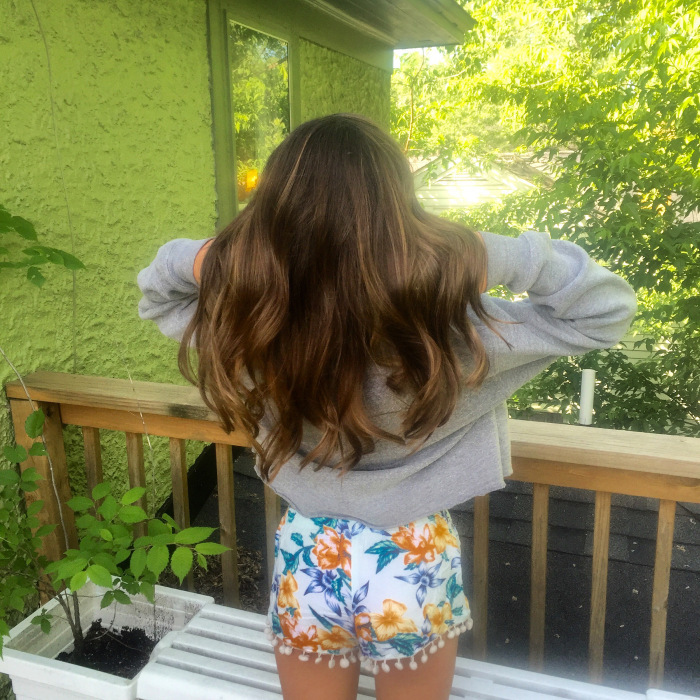 When it was completely dry, I used a 1″ GHD styler to create a beach wave. After curling the whole head, I used Aveda Air Control Hairspray to set it in place and add texture. That sounds like a lot of steps, but it’s totally do-able for a daily style. Plus, a style like this will last 2-3 days with minor tweaking in the morning. I had a great time with Sara and you should totally check out The GR Guide for all the updates on everything Grand Rapids! Our beautiful model Kim Ray wanted to do something different for summer, she had been light for some time and decided to change it up and go dark! We did an all over translucent dark chocolate shade to honor all of the dimension that she already had and added some super blonde high contrasting pieces all through her face framing to add some interest and a touch of a sun kissed feel. Kim already had an awesome haircut for summer, full of tons of layers and face framing, so we touched it up a bit and decided to style it with more curls than she does normally. 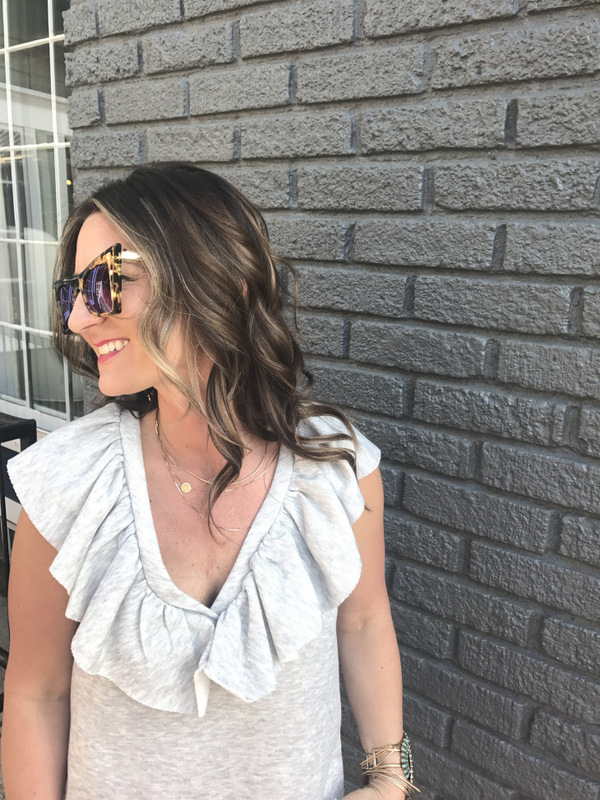 Since Kim has natural wave in her hair, adding more curls will help when she goes out into the heat and humidity this summer and to work with the wave that will eventually start to come out after a long day of fun in the sun! To get Kim’s style, try adding some Aveda Pure Abundance Style Prep at the roots before blow drying and then after curling finger through the curls to make them a touch more relaxed with Aveda Smoothing Fluid. 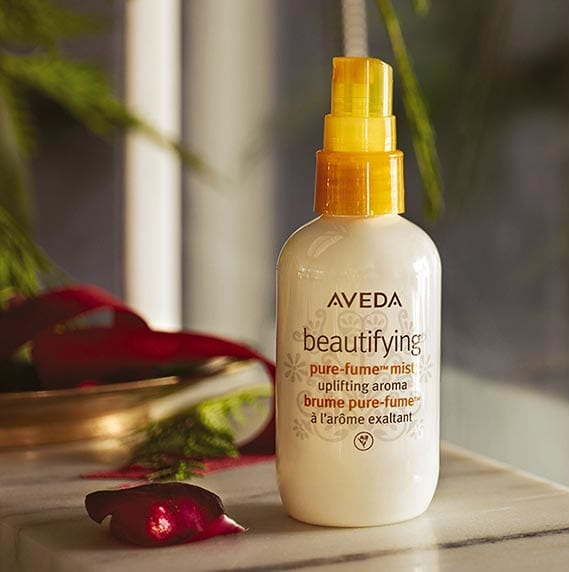 Finish with a little Aveda Air Control hairspray which allows movement and you’re good all day! For makeup, Kim already has beautiful skin, and no one wants to be weighed down in the summer, so we put on some Aveda tinted moisturizer (which has SPF15 yay!) and for added glow dusted some of the new Seychelles sand face accent as a highlighter on the tops of the cheeks, down the nose and on the brow bone. A warm olive shadow- Night Silk in the eyelid creases helped make her eyes pop with her new hair color and we finished it off with a natural brown eyeliner and some simple mascara. The big thing this summer is a bold lip, so for Kim I picked an amazing pink – Aveda’s wild fuchsia, this pink can go anywhere and looks great as a last minute touch before you pop the sunglasses on and run out the door! 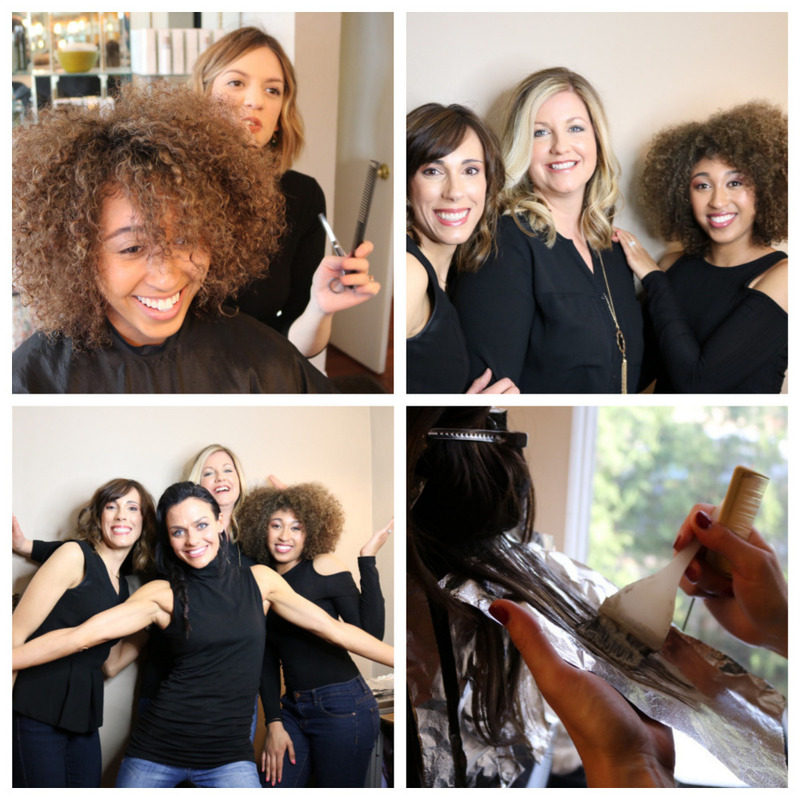 This March, our team at Coiffeteria Salon put together three looks that showcase some fun ways to change up your look for spring! We had a great time expanding our creativity and stretching ourselves to create new looks for three of our own. Corina, Kali, and Cahara were our beautiful models for the day. For Corina’s hair, Melissa brightened up her locks using a new technique called foilayage. This technique blends balayage ( hair painting) with traditional foiling for a seamless transitional brightness all over the head. She then styled Corina’s hair using Corina’s natural wave. After diffusing Corina’s hair, she used a small curling iron to add a few curls and smooth some that were a little too crazy. Cahara wanted to be lighter and brighter, so Demi added to her existing highlights and toned everything down to a cool blonde. Demi used a diffuser to dry Cahara’s natural curls and back combed everything to add loads of volume. Kali also wanted to be brightened up, so Mackenzie did a retouch to add volume and depth at the roots, then did a ton of foiling using a back combing technique to blend the highlights. Lori gave her an amazing long bob or “lob” haircut with lots of texture and layers. She then styled Kali with bouncy, loose, wavy curls to accent the color and cut. Julie used Aveda makeup to brighten everyone’s skin. She added pops of coral, pink, and grey to accent the eyes and lips and used a soft liner to really draw attention to the eyes. These girls were glowing by the time she was done with them! We hope your are as inspired as we are to change up your look! 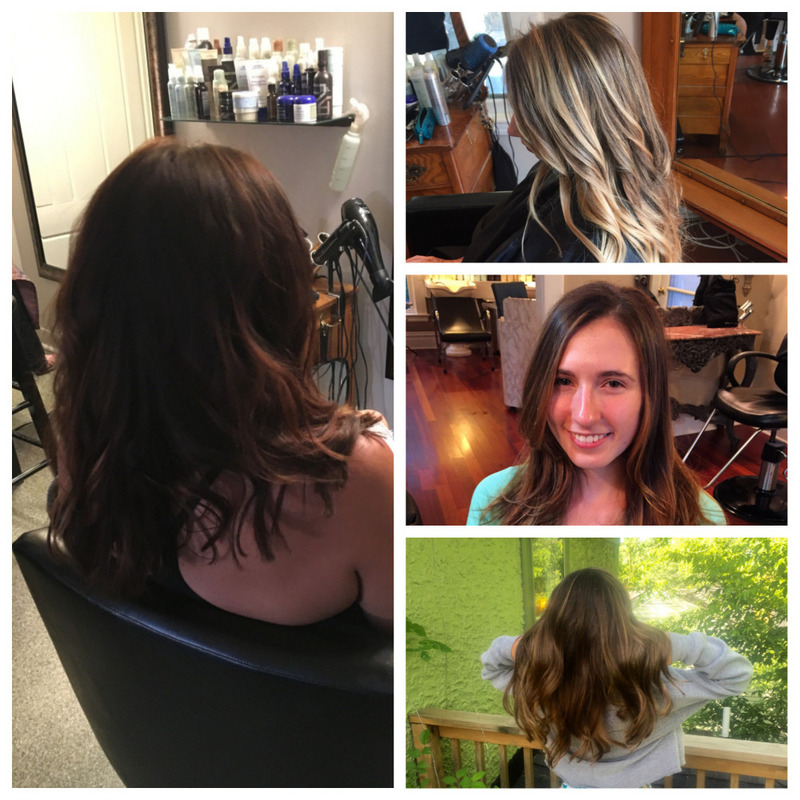 Call us at 616.459.4884 to book your spring makeover today! We are so excited to introduce the spring makeup collection from Aveda: Solstice Bloom!! We’ve got five (count ’em, FIVE!!) brand-spanking new lip colors! 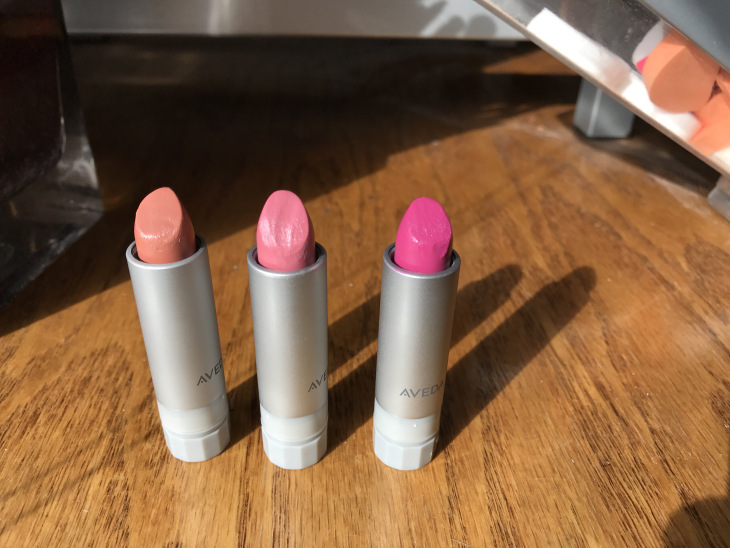 Two rehydrating lip glazes: Sheer Flamingo and Sheer Tulip, and three moisturizing lipsticks: Coral Sands, Pinkstone, and Pink Zinnia. 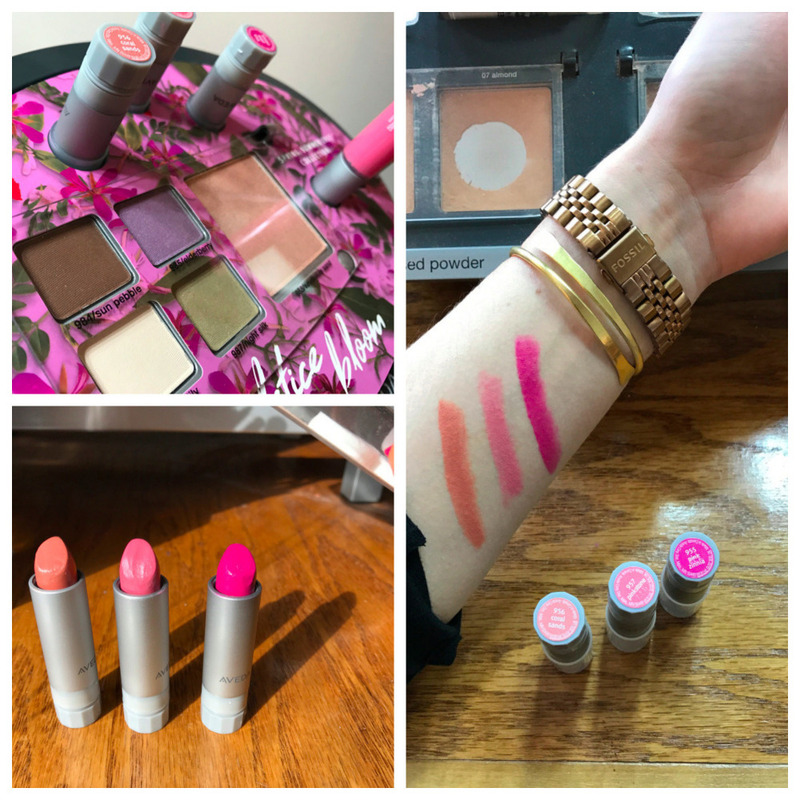 All of these lip colors have a minty scent and are super moisturizing! Hurry in, these are limited edition shades, and they sell out fast! We can NOT wait for Spring and this makeup is helping to usher it in! If you’re in the neighborhood, come stop by and try on some of this gorgeousness for yourself! Ahhhh… Summer. I don’t think anyone dislikes that word. It’s a great time to hang with family, friends, have barbecues, jump in the lake, do some gardening, and lay in the sun. It also means loads of selfies and snapchats of you all over the internet… yikes! It’s ok, we’ve got you covered with super cute, easy styles to try for this season. 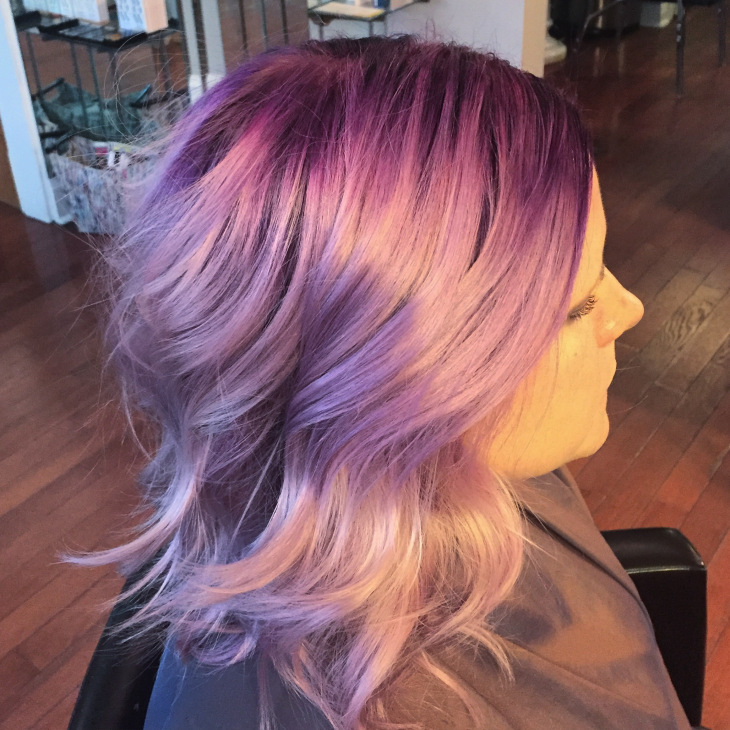 Pastel colors are still so fun- and especially this first picture, which Eve did a awesome job blending a deep violet to a dusty, pastel violet on the ends. 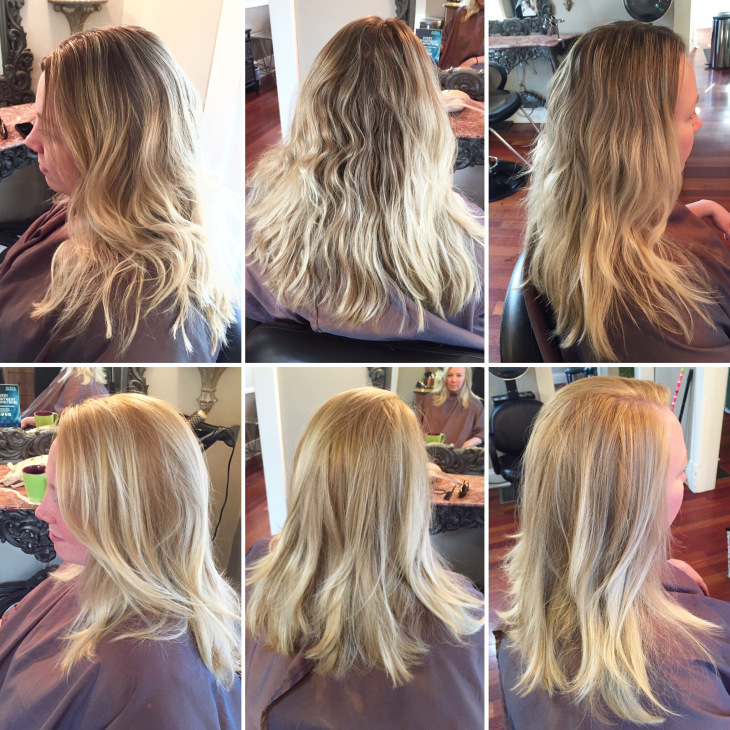 Here’s a before and after of a blonde who wanted to lighten up all over! 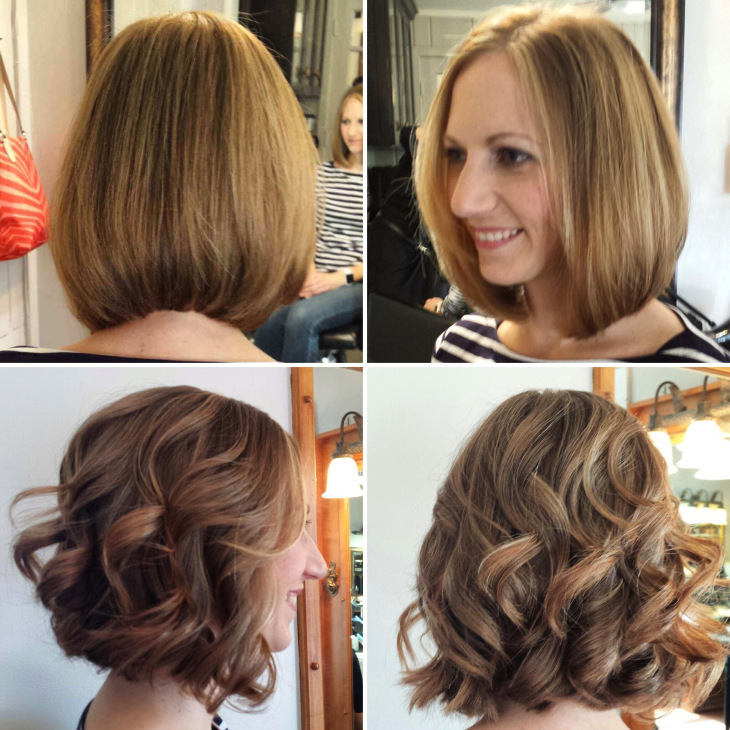 Here’s two ways to wear a shoulder-length, angled bob. What a great shape! Come on in to Coiffeteria and get your hair ready for summer!